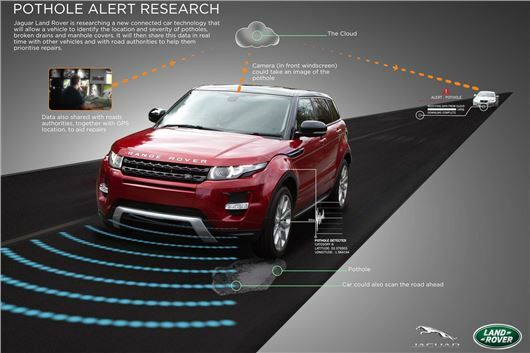 Jaguar Land Rover has developed a ‘pothole alert’ system that "could help save motorists billions of pounds in punctures, vehicle damage and road accidents every year," says the company. The bold claim is the result, JLR hopes, of a system that locates potholes, manhole covers and broken drains, then shares the data in real time – including the severity of the craters – to a cloud network that’s shared with local authorities. What the authorities then choose to do with this information is out of JLR’s hands, but the company hopes it will at least help them to "prioritise repairs." That said, in response to the system Coventry council has trotted out a lovely quote about potentially saving the good old taxpayer money. Says Councillor Rachel Lancaster of Coventry City Council: "We already collect lots of data which we monitor very carefully ourselves but having this kind of extra information might allow us to further improve our maintenance programmes, which would save the taxpayer money." More likely to mitigate the issue in reality is the part of the system that adjust the car’s suspension to help reduce damage when a meeting with a pothole is inevitable. It will also warn other vehicles about severe potholes on the road, allowing drivers to avoid them, or at least slow down. "By monitoring the motion of the vehicle and changes in the height of the suspension, the car is able to continuously adjust the vehicle’s suspension characteristics, giving passengers a more comfortable ride over uneven and damaged road surfaces." "While this gives our customers a more comfortable ride, we think there is a huge opportunity to turn the information from these vehicle sensors into ‘big data’ and share it for the benefit of other road users. This could help prevent billions of pounds of vehicle damage and make road repairs more effective. Dr. Bell continues by explaining that the company is working on a system that will automatically guide a car around a pothole – or even stop the car if the pothole was big enough.